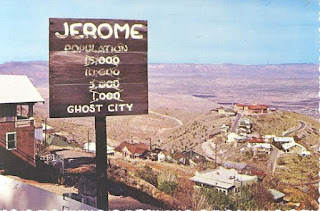 Jerome, Arizona was an old mining boom town. Today it's a tourist trap (a very small version of Virginia City, NV). As with Virginia City, they are still pulling gold out of local mines. The city is built on the side of a mountain and when you visit, plan on climbing up and down in order to see everything that the place has to offer. "Tourist trap" notwithstanding, there is a lot of history still present when you walk the narrow streets (with the working mines in background), looking through the clear air all the way to Sedona, about 40 miles away. Because carrying a sidearm is completely legal in AZ, some people carry and its interesting how things come back around. 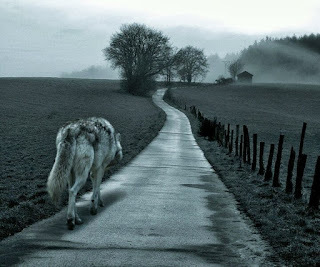 It's a two hour drive from the White Wolf Mine, high on the Mogollon Rim, but it's big country and it was founded by big people who weren't afraid to travel long distances on foot, on horseback or on a wagon drawn by mules. Today I used a car. And it made me wonder what those 49ers (not the San Francisco football team) would have thought about driving here and there in air conditioned splendor with satellite radio blasting in the background. Jennie Bauters was one of the most famous residents of Jerome. In 1898, she arrived at the rough and tumble mining camps in Jerome from Belgium and went to work. A purveyor of love to the lonely miners, Jennie was the wealthiest woman in Arizona on the day that she was murdered. I think that it was a combination of management skills as well as personal charm that led to her personal fortune and possibly to her ultimate demise. Cashing in on gullible tourists with more money than common sense is what tourist traps do. In addition to the history, the t-shirts, the over priced food and the souvenirs (that end up as landfill), there are the ghost town tours. Though Jerome was never a 'ghost town', the locals still pitch that. There are many ghost towns in Arizona and this blog will take you to some of the coolest in the future. We'll also haul you along to places like Tombstone, still an operating and living city even though the Earp brothers and Doc Holliday are long gone. ...There would be a rifle behind every blade of grass. Thus the gun culture in America is explained. The Second Amendment, guaranteeing the RIGHT of Americans to arm themselves has more to do with defending life and liberty than it does with hunting. It's position in the Bill of Rights indicates that it's not an afterthought, though the corrupt, elite, smug, nasty, lying mainstream media - which shills for the progressive movement would tell you otherwise. War Planner posted this on his blog, and I've shamelessly lifted it for its use here. The inner city person in the video (below) sets forth his own frustration and concerns at talk of a race war that some black people have advocated against white people. His first words explain that if blacks decide to rise up against other races, they will be "pig food". I ask myself, why black people would want to do that. We're all Americans. Aren't we? He suggests that inner city people don't have a culture of marksmanship, whereas even white girls are trained by their parents to drop ordnance on target. I have 4 daughters. They were trained to be lethal so I take his point. Anyway, he explains his reasoning on the video. The above accurately sets forth how I was trained as a young man, starting somewhere around age 6. It carried through and I'm a bit older now. I have eight grandchildren, each of whom needs his own AR-15. I wonder if I can get a deal by buying quantity in Arizona? California has tried to destroy weapons by making them less effective. No need to buy them here. Truth be told, you're better off buying arms and ammo from the Mexican drug cartels if you live in California. They have better gear, bargain basement prices, and don't require that you fill out paperwork or go through a two-week waiting period. They also have a much better selection than available in stores. They also have Claymore mines, hand grenades, belt-fed squad automatic weapons, grenade launchers and RPG-7's for the defense minded. Competition keeps the price down and they sell to the public. YOU KNOW THAT I'M KIDDING, right? The State of California says that it protects honest citizens from drug cartels - no cartel members here. And because having an unlicensed firearm in California is a crime, that will deter even the most ardent parolee at large. Have a splendid weekend. Try to get out to the range because while speed is fine, accuracy is final. This ends your sermonette.